Chromates are used in order to coat metal parts to provide a longer life for the part. Chromating is commonly performed on zinc-plated parts to make them more durable. The chromate coating acts like paint, protecting the zinc from corrosion, this can make the part several times more durable depending on chromate layer thickness. Chromates can come in many different colour variations: clear, blue, yellow or black. 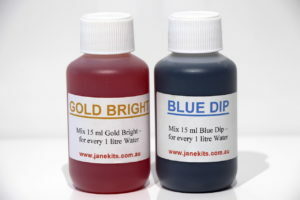 Jane Kits offers three chromates in blue, yellow and olive drab variations. They are referred to as Gold Bright, Blue Dip and Olive Drab. These chromates are trivalent chromium chromates and therefore have an extremely lower toxicity to the traditional hexavalent chromium that was traditionally used. 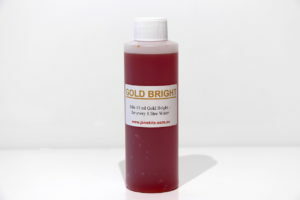 Gold Bright is a traditional yellow chromate that is commonly found in many automotive and construction industries. 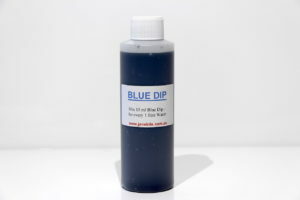 Blue Dip is a trivalent chromate conversion coating for zinc. It imparts a clear blue coating with no evidence of yellowing. Both of these chromates are included in our Zinc Plating Kits or can be purchased individually in various sizes via our website. 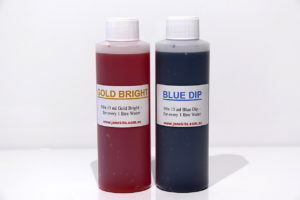 Both Gold Bright and Blue Dip chromates are very concentrated and will need to be mixed with water at a ratio of 1.5 % (i.e. 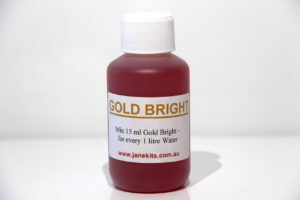 15 ml to 985 ml water per 1 litre working solution). 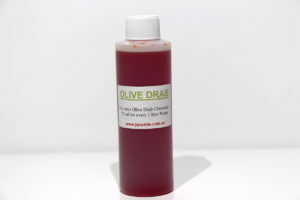 Olive Drab chromate is an extremely economical single dip chromate conversion coating, which produces a protective olive green coating on zinc electrodeposits. Olive Drab produces a heavy chromate film, thereby providing maximum corrosion protection and a better base for paint. It can be used as an economical substitute for an organic primer under paint, saving both materials and labour, or as a final finish, providing both protection and colour. It is commonly referred to as a military colour. Olive Drab is supplied as a liquid concentrate, which is diluted at a ratio of 7.5 % with water to form the working solution. (i.e. 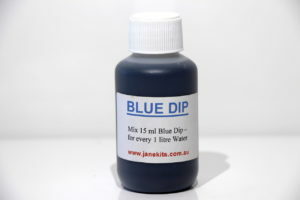 75 ml Olive Drab to 925 ml water, to make a 1 litre working solution) The freshly zinc plated articles are immersed in the working solution for 20 to 60 seconds to produce a tough, olive green conversion coating. Chromating is a simple dip process and does not require any electrical current or complicated bath set up. The procedure is straight forward and needs to be done immediately after parts have been zinc plated. Following the zinc plating procedure, the parts continue through a cleansing and activation process. The activation chemicals required for this procedure is called Metex IT. This is essential for good adhesion of the chromate. The parts are immersed in the chromate solution and left for the correct time. The immersion time in the following cold rinse should be about 1 minute. If the coated article is taken out of the rinse too early, the water running off the articles may produce a drainage pattern of a lighter shade spoiling the decorative finish. NOTE only use deionised, demineralised, distilled or rain water to create your plating bath. Do not use tap water. It may have too many additives that will contaminate your bath. METEX IT is a dry acid material that is mixed with water. This is used as a pre-dip activator before passivating. It will improve the appearance of the passivating, enhance the adhesion and lengthen the life of the passivating solution. The Metex IT is mixed at a ratio of approx 20 grams per Litre and dip for 30 seconds. 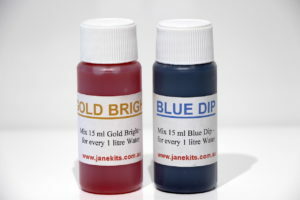 Gold Bright and Blue Dip are available in various sizes and are both mixed at a ratio of 15 ml chromate per 985 ml water. With all Jane Kits products, the key to successful plating is in the preparation of the items to be plated. Parts must be chemically clean. 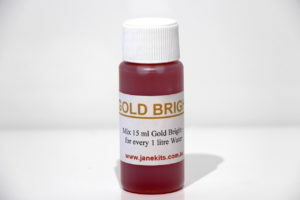 In order to ensure that you get pleasing and consistent results, Jane Kits sell very efficient Cleaner Kits (see cleaners). Thorough cleaning is essential in the preparation of parts prior to electroplating. NOTE only use deionised, demineralised, distilled or rainwater to create your plating bath. Do not use tap water. It may have too many additives that will contaminate your bath. JANE KITS does not accept any responsibility for any injuries or for any ill effects resulting from the careless or improper use of any of our products. No responsibility will be accepted for any injuries or for any ill effects or accidents resulting from the improper storage or lack of your safety markings on our products. All products should be used with care and as per the instructions in this Plating Manual. All MSDS are available on request. NOTE: Care should be taken by the bath operator no matter what type of bath is being used. Avoid allowing chemicals to remain on your skin for long periods. Safety glasses and clothing that covers arms and legs should also be worn. A well-ventilated room is necessary and avoid inhaling fumes that are present during the plating or mixing processes. A suitable respirator is recommended.